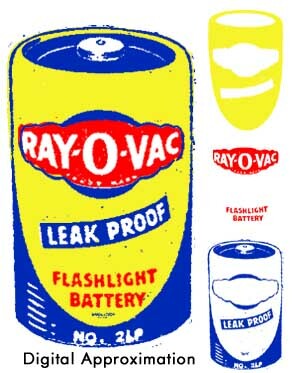 It's a three-color image of a Ray-O-Vac battery (if you couldn't guess). 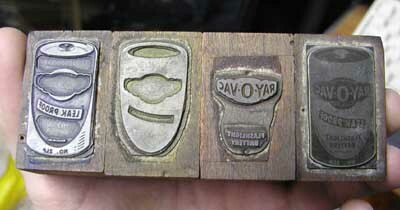 I've developed a cool technique for converting a photo of a print block into something resembling what it would look like if actually run off on a press. To do the pic above, I had to take pictures of all three color blocks, adjust for size and perspective, then change them to the proper color and overlay them. Looks cool, eh? No -- really -- THIS is the final, bestest webpage for blacksunn.net! Really! Don't you believe me? It's been through many incarnations, from very work-related, into uselessness, into a front-end for my other online workings, to being a redirect to apathyindustries.com, and finally a "new website coming" page. Now, it's come all the way 'round to business related again. Hope it helps; I figured I better have something there, since I'm giving out business cards with the URL on it. As for this being the 'final version' of blacksunn.net, I highly doubt it. Today was a beautiful day -- 81 degrees according to the display at the stripclub. We were on our way home after a trip to Media Play, because Allie wanted to buy the soundtrack for a movie she just saw. Destiny was on her way home from school, and D & I still had errands to run. Allie stayed home with Des, I and D went out and about, stopping for Dairy Queen on the way. At around 4:30, clouds rolled in and it started to spittle a little rain in the dirty wind. Our carousing done, we headed back home in the midst of rush-hour traffic. Everyone missed the chance to be outside in the nice weather. God is punishing the 9-to-5 workers. I, however, got to stand in the sun for a while. Who knew being unemployed would be so much work? Talking to the retirees I know, it's a common misconception. Also, I'm occupying my unemployed hours with a dab of self-employment, so I suppose that offsets everything. eBay is keeping the money coming in, and we've now got a booth at an antique mall, plus I'm slowly developing my computer business into something marketable. Fun stuff, eh? More striking is the absence of any time reference. Sleep until 10, go to WalMart at three in the afternoon, work until after midnight, and the only indication of weekend is that the kids are around the house all day. You full-time workers don't realize how much your job provides a frame of reference: Arrive at 8, coffee at 9:30, lunch at 12, coffee at 3, home at 4:30. That's a reference point every two or three hours. Without those, how would you know where you're at in the day? Me and D are planning on getting a clock that chimes every hour. If we hang it in the office, hopefully it will provide some much needed grounding in the flow of time.